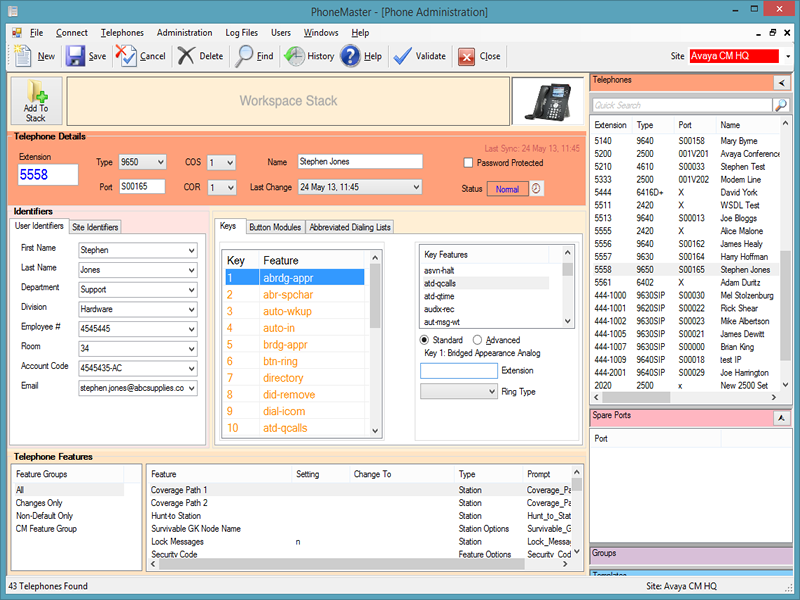 PhoneMaster is an administration tool for Avaya Communication Manager, Avaya CS1000 and Legacy Nortel Meridian & CS1000 telephone systems that allows you to make programming changes on the telephone system without needing to know anything about the sophisticated command-line programming language. With its vast range of easy-to-use features, PhoneMaster reduces the programming of the telephone system to simple point-and-click and drag-and-drop operations. Please see our required technical specification for PhoneMaster 6 by selecting any of the options below. The technical specifications outlined below are our minimum operating requirements for PhoneMaster. For optimum performance we recommend using a higher specification. Note: Phoneware Limited is not responsible for the connection between the PC/Server and the telephone system. Directly connect from a free serial port to the telephone system SDI/TTY port. Telnet using a serial server device that’s connected to the telephone system SDI/TTY port. TCP/IP connectivity is supported to the Call Server running the necessary software release. Use SSH to connect to the Call Server that is running the necessary software release. PhoneMaster 6 communicates with the Avaya Communication Manager via an AES (Application Enablement Services) Server using SMS (System Management Service). Provides the ability for third party applications to interface with Avaya Aura Communication Manager as an evolution server, through standard web services via SOAP/XML methods. Provides a way for applications to programmatically access and administer a subset of administration objects on Avaya Aura Communication Manager. This enables a wide range of applications that can provide value by manipulating Avaya Aura Communication Manager features. Beginning in AE Services 5.2, System Management Service (SMS) is no longer discretely licensed in AE Services. This capability is provided to all licensed systems. Note: Once any AES service is licenced on the Avaya Communication Manager the SMS service will be active. The following procedure describes how to install the PhoneMaster Interactive Demo. After successfully downloading the PhoneMaster Interactive Demo, run the file name PM6DemoSetup.exe from the directory where you downloaded the file to. This installs the PhoneMaster files in a directory of your choice (the default directory being C:Program FilesPhoneMaster6 Demo). Our on-line Help facility will help you learn about the features and facilities provided by PhoneMaster. The on-line Help can also be viewed by clicking the Help button or the F1 key on any screen or by using the Help menu.